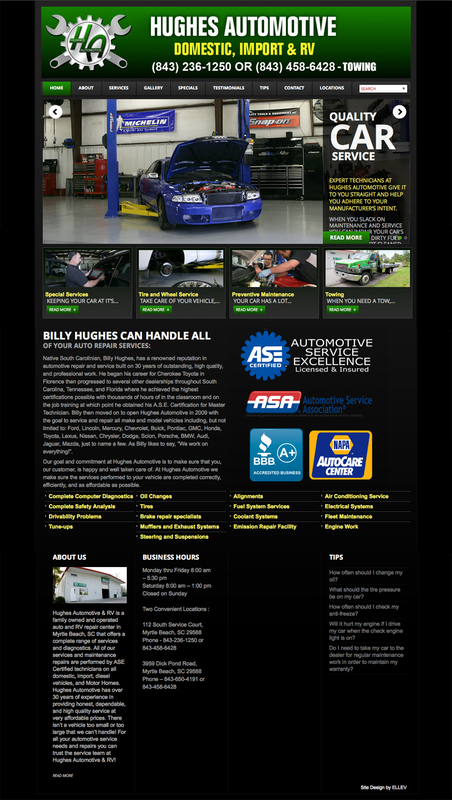 Hughes Automotive - Ellev - The Best Full-Service, Award-Winning Ad Agency in the Carolinas! One of the biggest hurdles that companies face when they are building websites is getting their message and information across to the viewer. With Hughes Automotive this is something that we had to tackle with them. We had to convey their years of experience and expertise in so many areas. We had to inform the viewer of recommended and necessary maintenance, tricks of the trade, and tips for the driver and automobile owner. We also had to convey the importance of all this and the importance of using Hughes Auto for any automotive needs as they are the best! So we did that with very concise and structured design with easy navigation and good layout for content and copy. We, at Ellev, hope that this design helps to get your motor running!